AdGuard DNS is a foolproof way to block tracking and ads on the Internet that does not require installing any applications. It is easy to use, privacy-friendly, absolutely free, can be effortlessly set up on any device, and provides you with minimal necessary functions to block ads, trackers, malicious websites, and adult content (optionally). To start using AdGuard DNS, set up the addresses of Domain Name System (DNS) instead of those given by your service provider. AdGuard DNS is free of charge for personal use. When you use AdGuard DNS, every time a browser or an app sends an ad request, our server responds with an empty response. AdGuard has its own base of domain names that serve ads, trackers and fraud, and it is regularly updated. 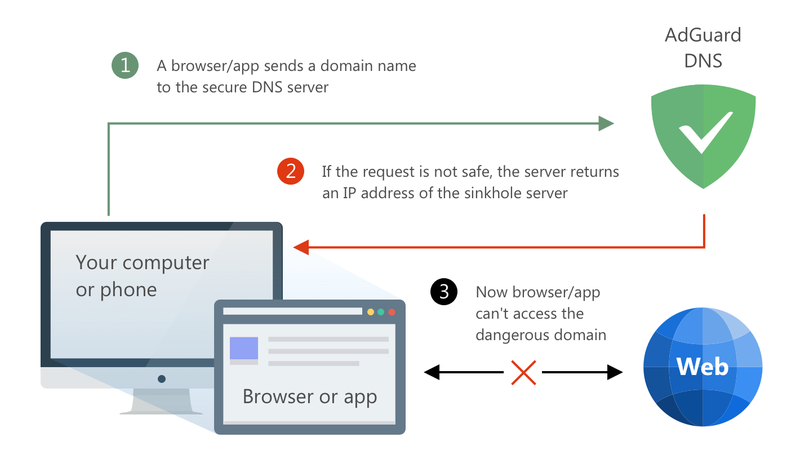 We offer two modes for AdGuard DNS to work in. The Default Mode includes blocking ads, counters, malicious and phishing websites. The Family Mode does the same, in addition blocking adult content and enabling safe search for your browser. AdGuard DNS can work on any devices, including smartphones and tablet PCs. There are no equipment limitations. Does not require installation of any applications. All you need to do is to follow this simple setup guide. AdGuard DNS is open source and absolutely free in personal use. Supports all modern DNS privacy standards: DNSCrypt, DNS-over-HTTPS, DNS-over-TLS. It has two modes: "Default" for blocking ads and trackers, and "Family" for the same functionality plus parental control tools. We have strict no logging policy. We do not preserve any personal data or log your activity. Your anonymity will be maintained. You can use it on any Windows, macOS, Android, or iOS operated device. How to configure AdGuard DNS? Go to respective Knowledge Base chapter to read the detailed setup guide.